Editor's Note: There is an image associated with this release. 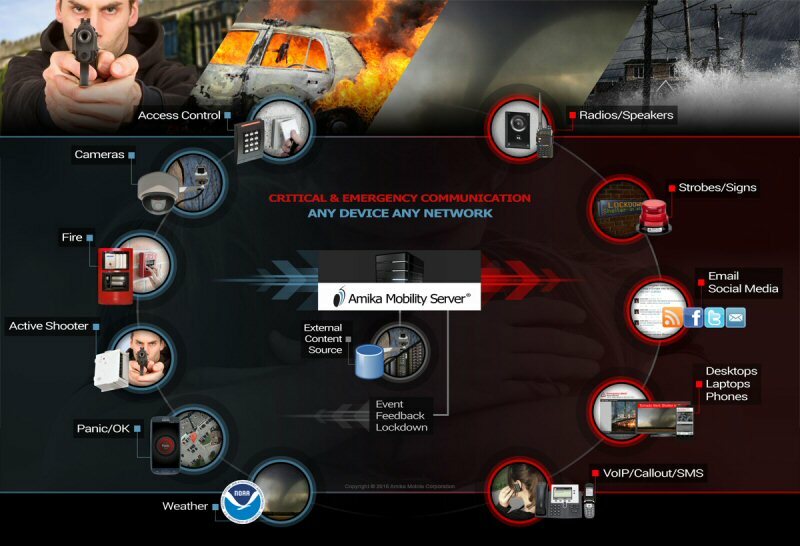 Amika Mobile's Amika Mobility Server (AMS) for critical and emergency communications platform has been selected as a finalist and can be voted for as the People's Choice Award for ASIS 2016 because of its unique integration with single or multiple gunshot sensor detection supporting unlimited escalation to individuals, groups or personnel automatically discovered within affected network zones. "It is exciting to have been selected as a finalist for Accolades for the 8th year as this typically honours the Top 50 at the show. Amika Mobile is consistently selected because of our product innovations, including our latest integration with gunshot detections addressing prevalent active shooter threats facing our customers, and our unlimited escalation through zonal auto-discovery," said Amika Mobile CEO Dr. Sue Abu-Hakima. ASIS is in its 62nd year with nearly 700 security vendors exhibiting. ASIS Accolades judging is based on innovation and excellence of security products. Amika Mobile has consistently been a finalist for ASIS Accolades since 2009 and won the Judge's Choice in 2015 for AMS as an IoT platform for Critical and Emergency Communications. ASIS is known as the world's most influential security conference and trade show and brings approximately 20,000 security professionals together. The AMS enables situational awareness, information sharing, rapid 2-way communications across devices and networks, and control through advanced integration with physical security such as gunshot detection sensors to trigger lockdowns with looped voice over the paging system. AMS triggers alerts and receives responses from ANY communication layers including VoIP, SMS, Pop-ups, web, overhead monitors, digital signs, twitter, tickers, based on sensor events from gunshot detectors, access control, fire panels, camera systems, building automation, government agency or weather alerting feeds, panic buttons, etc. The public safety and security market is growing from $305B in 2011 to $546B in 2022 according to Homeland Security Research Corp. in Washington, DC. Amika® Panic in conjunction with AMS and Amika® Situation Commander fits nicely into this market which includes incident management, communication and control systems, and mass notification. Demonstrations of the AMS, Gunshot Sensor Integration, Amika® Situation Commander critical and emergency capabilities and Amika®Panic and Amika®Alert Mobile apps will be showcased at the 62nd international industrial security professionals' tradeshow, ASIS 2016 from September 12 to 15th in Orlando, Florida at Amika Mobile booth #4055. Amika® Mobility Server with Gunshot Sensor Integration and Unlimited Escalation is a candidate for ASIS People's Choice Accolades award. You can make sure it wins by voting at the Accolades Showcase at the venue and on the 2016 ASIS mobile app. Voting opens Sept. 12th and ends Sept 13th. Amika Mobile®, Amika® and Amika®Panic are registered trademarks of Amika Mobile.